Hello! I hope you are enjoying July as much as I am! I am sitting in the warm sun as I type! Today we will be talking about yeast. Yes yeast...well more specifically leaven. This command is 'Beware of Leaven.' Christ said, "Take heed and beware of the leaven of the Pharisees and of theSadducees" (Matthew 16:6). When Christ first said this to His disciples, they thought that He was referring to the bread they had forgotten to bring with them. After Jesus further explained, they understood that He was talking about the leaven that was the Pharisees and the Saducees' hypocrisy. Why did Christ use the term 'leaven'? 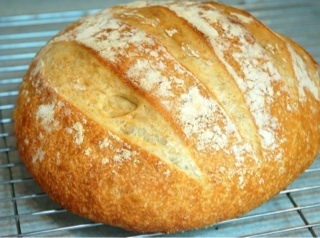 Leaven or yeast, is a substance that in small amounts, has the power to affect a whole batch of dough. Throughout the Bible, leaven is often associated with evil and sin. In the Old Testament, yeast was forbidden in offerings to the Lord and in the Passover feast. I Corinthians 5:7 says, "...Know ye not that a little leaven leaveneth the whole lump?" Sin is like yeast, because allowing even a little of it in our lives brings great destruction and effects more than we anticipated. A couple Sundays ago a young man from my church gave a powerful testimony. He explained how he had neglected spending time with the Lord and how God had used an injury to help him see that he needed to be focusing more on the Lord. God showed him that he was focusing too much on clothing and that just a little neglect had led to wrong music and rebellion to his parents. He realized that this sin had crept in and that he needed to change. He memorized key Scripture verses and got accountable. It was so encouraging to hear a young man 'take heed to leaven' and be willing to purge it out of his life. Praise the Lord! The 'leaven' or sin of the Pharisees and Saducees was hypocrisy. "..Beware ye of the leaven of the Pharisees which is hypocrisy" (Luke 12:1b). They had replaced man's tradition with God's Law, such as tithing herbs, but neglecting the bigger matters. The Pharisees 'majored on the minor points and violated the major points.' Their motivation was not to love God and others as themselves, but rather they were motivated by pride which led to rampant hypocrisy. One day we will be judged according to what we have done, whether it was good or bad (II Corinthians 5:10). Will our goodness be that we tithed our herbs? or looked like good Christians? It is great to tithe and to look nice to others, but it must be an outflowing of a heart that loves God and others. -Have I allowed a compromise in my life which could lead to great destruction? -How can I protect myself from 'leaven' in my life? -Do I try to cover up selfish motives with good works? "And the Lord said unto him, Now do ye Pharisees make clean the outside of the cup and the platter; but your inward part is full of ravening and wickedness" (Luke 11:39).